What is the Alabama TREASURE Forest Association? Alabama TREASURE Forest Association members are stewardship-minded men and women dedicated to improving the forest lands of our state and nation. These lands are managed for many resources, including wildlife habitat, pine and hardwood timber resources, clean water, recreation opportunities and beautiful scenery. When managing the forest for multiple resources, we take into account the many aspects of the forest to ensure that all of the benefits it provides are maximized. A primary goal of the Alabama TREASURE Forest Association is to teach others about responsible forest management. 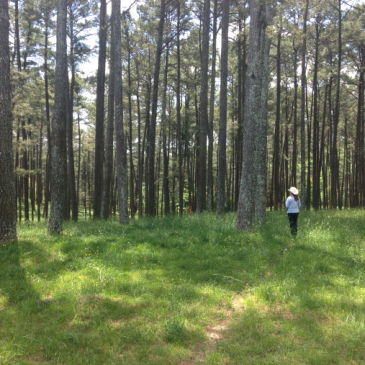 While we recognize that every forest landowner has different objectives for owning their land, we hope that someday all forest lands in Alabama are managed according to the TREASURE Forest Philosophy. We feel that every landowner can use this philosophy to reach their goals. In the fall of 2013, ATFA enhanced these efforts by partnering with the largest landowner organization in the state, the Alabama Farmers Federation. This affiliation leverages Alfa’s grassroots organization of over 350,000 members as well as its strength in the public policy, research and promotion arenas to achieve ATFA goals. To learn more about the Alabama Farmers Federation, click here. In a very real way, the future of Alabama’s forests rests in the hands of landowners and like-minded individuals that support them. The Alabama TREASURE Forest Association is a 501 (c)3 non-profit, educational corporation in partnership with the Alabama Farmers Federation. Alabama has over 23 million acres of forest lands. These forests provide valuable resources that directly affect every Alabamian’s quality of life. They provide habitat for wildlife, such as deer, turkeys, squirrels and songbirds. Forests clean the air, purify the water and protect valuable topsoil. They provide recreation – a place to walk, picnic, hunt, fish, hike and camp. Forests provide timber, the raw materials that support Alabama’s number one manufacturing industry. This list could go on and on but these will suffice to underscore the importance of forest lands in Alabama. When one considers that most of these forests were cut over and the land was left bare and eroding during the period known in forestry circles as the “cut out and get out” era. Our present day forests are truly an unparalleled environmental and economic success story! This success story has been largely written by private forest landowners that own 95% of Alabama’s forests. The Treasure Forest Program was designed to promote responsible stewardship by private forest owners. It provides voluntary guidelines for responsible forest management and is a recognition program for landowners that are good stewards of their forest land. Since the inception of the Treasure Forest Program, established by the Alabama Forestry Committee in 1974, air and water quality as impacted by forests, has continually improved; more trees have been regenerated and harvested; many species of wildlife are larger and healthier; and the general environmental and economic well-being of Alabama is significantly better.